Memoir and essay writer striving to maintain sanity, humor and grace. Actions speak louder than words. Although my mom didn't give me much verbal advice, she modeled an important life lesson: It's not too late to chase your dream. Once a stay-at-home mom who produced League of Women Voters materials on a mimeograph machine in our attic, Mom went back to school in her late thirties. She earned a master's degree while working as a registered nurse, and soon moved from bedside nursing to administrative duties. An early devotee of Elisabeth Kübler-Ross, she became an expert on death and dying and spearheaded the startups of two community hospice programs. If my mother was ever scared about taking on these new endeavors, she didn't show it. Either she was fearless, or her stoic New England fortitude overshadowed whatever trepidation she may have had. She only wavered when it came to her most significant and unlikely career change. "I married a nice, Irish Catholic girl," my dad used to say. Then that nice, Irish Catholic girl became an Episcopalian. It was the 1980s and my parents were out to dinner with another couple when the conversation turned to Joseph Campbell and The Power of Myth. My dad and my parents' dear friends talked about "following their bliss." For awhile, my mom said nothing. She couldn't give voice to her deepest desire. Finally, they coaxed it out of her. "I think I'm called to the priesthood," she confessed. The cat was out of the bag and even though Mom was well into her fifties, it wasn't too late. 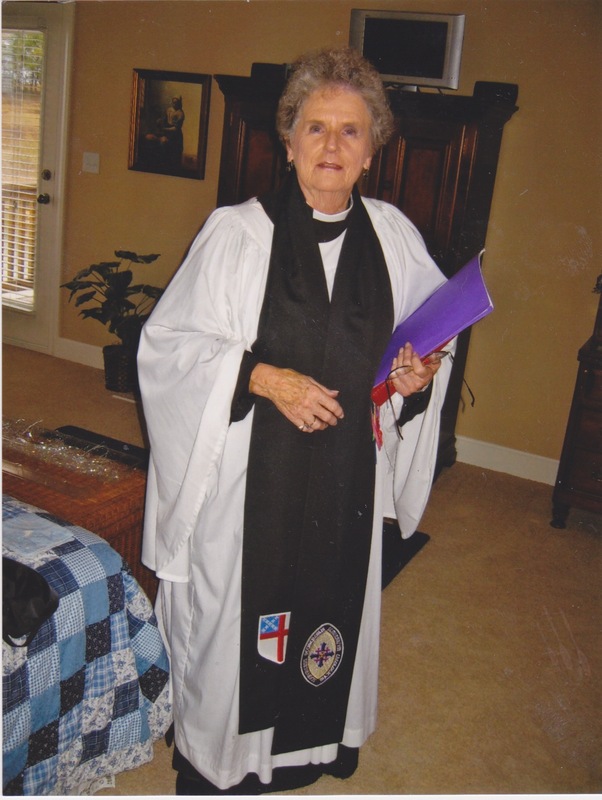 She attended seminary, did a residency in hospital chaplaincy, and was ordained an Episcopal priest at the age of 61. She thrived on all things church, working long hours in parish ministry, including a difficult stint at a rural parish that was inhospitable to women clergy. She headed the pastoral care team at a thriving suburban church, visiting the sick, encouraging the downtrodden, holding the hands of the dying and running grief groups for the living. My mother continued to follow her bliss, still ministering well into her seventies. She didn't talk about retirement and had no intention of slowing down. "I'm going to work 'til I drop," she used to say. And drop she did, landing in a heap at the bottom of a short flight of stairs while taking out the trash on a hot, muggy August evening. She shattered her right shoulder and fractured her pelvis. Surgeries and rehab followed. Recovery was long and incomplete. An insidious dementia crept in and, for the first time ever, it really was too late to make another career move. Then I learned the second: It's never too late... until it is. Until the day when circumstances beyond your control intervene, when you no longer get to choose which path you're going to follow. When, instead of being the leader, you become the led. It's a valuable lesson for a daughter now only in midlife, feeling like there are many years to come while, at the same time, wondering how it is my children are suddenly grown. I can't assume there will always be more time. My bliss is different from my mom's. I don't have a bucket list and I don't have a manic need to rush out and make grand plans. What does feel compelling and urgent is that I embrace what is, that I don't worry so much, that I stay present and grateful; that I be a good steward of all that I have, remain mindful of my blessings, and recognize the miracles in my midst. The truth is, sometimes it is too late... but not yet. Today, I'm going to follow my bliss. Follow me @MaryNovaria on Twitter.